Dr. Tony Nader received his M.D. degree from the American University of Beirut, where he also studied internal medicine and psychiatry. His Ph.D. is in the area of Brain and Cognitive Science from the Massachusetts Institute of Technology (MIT), where he was also a visiting physician and Assistant Director at the Clinical Research Center. He completed his post-doctoral work as a Clinical and Research Fellow in Neurology at the Massachusetts General Hospital, Harvard Medical School. Dr. Nader has conducted research on neurochemistry, neuroendocrinology, and the relationship between diet, age, behaviour, mood, seasonal influences, and neurotransmitter and hormonal activity, and on the role of neurotransmitter precursors in medicine. 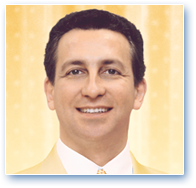 Dr. Nader’s desire to gain total understanding of the human mind and body—of consciousness and physiology—led him to the study of Maharishi’s Vedic Science and Technology under the guidance of His Holiness Maharishi Mahesh Yogi. On the basis of his knowledge of physiology, Dr. Nader has successfully correlated each aspect of the Vedic Literature to a specific area of physiology, with the conclusion that human physiology is the expression of Veda and the Vedic Literature. This is the subject matter of his first book, Human Physiology: Expression of Veda and the Vedic Literature. This discovery has been appreciated by scientists and political leaders throughout the world. Its practical application has been documented by original research conducted by medical doctors and scientists, which demonstrates the effectiveness of Vedic Sounds and Vedic Vibrations for the treatment of chronic disorders. In appreciation for his achievements in illuminating Vedic Science in the light of modern science, Dr. Nader was honoured by Maharishi with the title ‘Maharaja Adhiraj Rajaraam’ and given responsibility for guiding the Global Country of World Peace (www.GlobalCountry.org).